FOOD PAN CAPACITY: 6.6 Ltrs. For hotels, bars, restaurants, canteens, cafeterias, cocktail bars, institutions, hospitals, health food stores, juice bars, ice cream shops..."
Our ranges of Juice Dispenser are highly appreciated among our clients due to their trouble free performance. 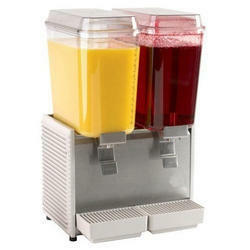 Our Juice Dispenser will give the trouble free and long lasting performance to the user. They are available in various models and can be availed at market leading prices. Juice serving on breakfast buffets is not limited to just single juice. People prefer to have choices, so to cater two diiferent beverages, we offer Double Juice Dispenser with 2 PC Jars of 7 lt capacity. 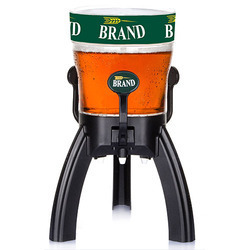 The stand offers a neat & clean way of serving & both the units are embedded on same base to save space. Being a leader in the industry, we are engaged in offering a qualitative range of Juice Dispensers. With the assistance of the efficient and qualified team, we manufacture gourmet display products like juice drink dispenser, milk dispenser, fruit stand and orange holder. Bar counter dispensers equipped with a slow mixer.They are easy & quick to dismantle and clean.Shock proof, non-toxic polycarbonate beverage bowls with independent mixing control.Models equipped with gravity stainless steel faucet are available on request.Also available, model with a pump which creates attractive fountain effect in the bowls. Leak proof in nature, these Juice Dispenser are made with the use of rust resistant metal. Free from damage by pressure and longer life working, these dispensers are perfectly finished with the use of best and highly efficient finishing tools. Moreover to this, these dispensers are quality tested by the professionals.